A first time visitor will notice there are many unique men in beauty saloons in Rwanda, especially Kigali City, Rubavu and Kamembe towns. It is no doubt these specialists in cosmetology enter Rwanda by merely crossing Rwanda’s border in the west. “Comment petit frere” the simple French greeting serves as a cue to realize they are men from the other side of Lake Kivu. It is a no brainier, for Congolese to be a true national of Democratic Republic of Congo, one must identify with French. That is part of my childhood memories some of which are based on wrong assumptions. The number of Congolese barbers in Rwandan beauty saloons raise my curiosity. I stroll to the next street and enter the beauty soloon where music was buzzing. It is Lingala. Now, the Swahili in here had roots in Kabila’s land. Gazing at a long queue of women, my curiosity increases exponentially. “Is my wife the next?” I ask a man with a light skin complexion, rotundus and talkative. By appearance, he is in mid thirties. He tells me I needed booking but his fingers remain glued on the client’s head, with slight manipulations. He tells me he had about eight waiting. I’m booking, I say. He gives me Sunday ten o’clock in the morning. This is the chance, the only one for me to know why these guys? I get his full contact plus the types of hairdo for my wife’s choice. The saloon is called Best East African Beauty Saloon, one housed by the Nyarugenge Market Building. Cyiza Barungu is his name. He came to Rwanda in 2000. Tinting, retouching, dreadlocks, plaiting as well as pedicure and manicure plus many hairdos. Just bring your wife, he says. That very Sunday of the appointment I am at the saloon ten minutes before. I tell him the truth. I excuse myself that am actually single and searching promising to bring my dream fiancée to him every weekend. He laughs, uncontrollably. We become friends and a spontaneous conversation ensues. “I went to a vocational technical school,” he says. Later, I learnt the Belgians introduced these schools in the former Zaire as early as 1930. He says, he got his skills from one of them. Most Congolese youths joined vocational technical schools including saloon services. When he was 15 years old, he also joined one of the vocational technical schools of Rubumbashi town. “I feel happy when I see fellow Congolese making a big name in Rwanda as the best providers of beauty saloon services,” he says. Just that you know, Barungu came to Rwanda due to the insecurity in Congo around the year 2000. Most Congolese crossed the border into Rwanda seeking refuge. Majority of them had different skills. Barungu has seen many Rwandans too now taking over the jobs. With the mushrooming of different vocational technical schools around, the Congolese now feel threatened. “Of course we taught many Rwandans, and many work with us. They are now performing very well and providing the same services,” Barungu says. The owner of the saloon who didn’t want her name revealed says that she hires more Congolese in her business because they are good at this skill compared to Rwandan counterparts. Valentine Umwizerwa works with Congolese in one saloon in Remera, a suburb in Koigali City. She says some clients walk away when they find no Congolese hair dressers. “Frankly, it is a blessing we are getting more skills and experience from the Congolese,” she says. 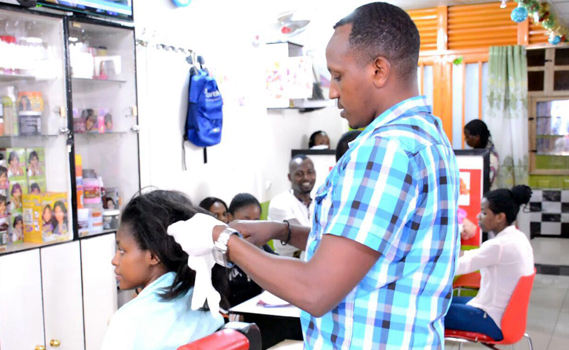 One of the hair dressers from Isalo saloon at the Rubangura building downtown, says, the reasons why Rwandan hair dressers are few in saloons, is simply because they are not professionally trained. “First of all many think this is a cheap job,” Umwizerwa. Yet, Umwizerwa says, there is demand for tinting, retouching, making dreadlocks, plaiting as well as pedicure and manicure and men hair cut. “I think these Congolese have something unique,” Umwizerwa says. “They are so much passionate about this kind of work, plus they want to learn to gain experience, and this is what makes them stay on top and dominant in male beauty saloons in Rwandan cities. Many people have always wondered why there are many Congolese in beauty saloons and why Rwandan women often prefer Congolese hairdressers. Well, I guess the puzzle has been cracked.